Ht / Wt: 5'10" / 186 lb. 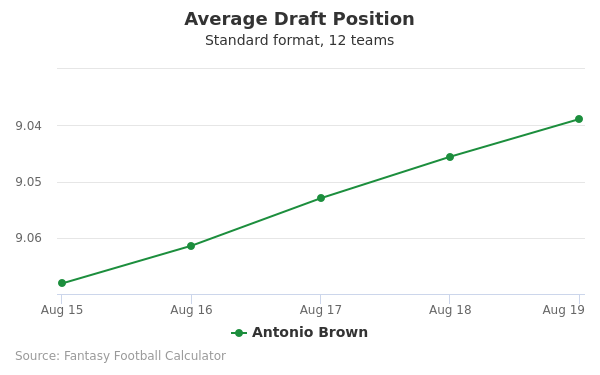 Antonio Brown's fantasy value is measured by his average draft position (ADP) in fantasy football mock drafts. 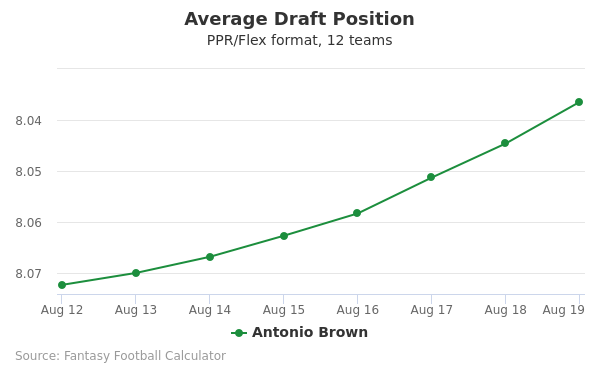 In recent drafts, Brown's current ADP is 2.08, which indicates that his fantasy outlook is to be the 8th pick of the 2nd round, and 19th selection overall. 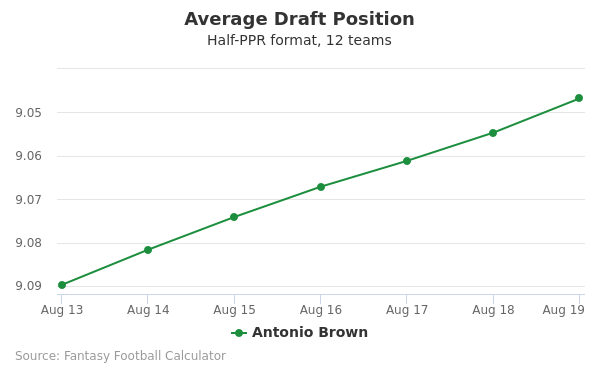 The code below will display a graph that updates every day to show the ADP data for Antonio Brown for the past 30 days in 12-team PPR leagues. Draft Antonio Brown or Nick Chubb? Draft Antonio Brown or Pat Mahomes? Draft Antonio Brown or Mike Evans? Draft Antonio Brown or Marlon Mack? Draft Antonio Brown or Zach Ertz? Draft Antonio Brown or T.Y. Hilton? Draft Antonio Brown or Damien Williams? Draft Antonio Brown or Leonard Fournette? Draft Adam Thielen or Antonio Brown? Draft A.J. Green or Antonio Brown? Draft Antonio Brown or Sony Michel? Draft Antonio Brown or Keenan Allen? Draft Antonio Brown or George Kittle? Draft Antonio Brown or Mark Ingram? Draft Aaron Jones or Antonio Brown? Draft Amari Cooper or Antonio Brown? Draft Antonio Brown or Phillip Lindsay? Draft Antonio Brown or Derrick Henry? Draft Antonio Brown or Stefon Diggs? Draft Aaron Rodgers or Antonio Brown? Draft Antonio Brown or Devonta Freeman? Draft Antonio Brown or Chris Carson? Draft Antonio Brown or Brandin Cooks? Draft Antonio Brown or Derrius Guice? Draft Antonio Brown or Kenny Golladay? Start Antonio Brown or Nick Chubb? Start Antonio Brown or Pat Mahomes? Start Antonio Brown or Mike Evans? Start Antonio Brown or Marlon Mack? Start Antonio Brown or Zach Ertz? Start Antonio Brown or T.Y. Hilton? Start Antonio Brown or Damien Williams? Start Antonio Brown or Leonard Fournette? Start Adam Thielen or Antonio Brown? Start A.J. Green or Antonio Brown? Start Antonio Brown or Sony Michel? Start Antonio Brown or Keenan Allen? Start Antonio Brown or George Kittle? Start Antonio Brown or Mark Ingram? Start Aaron Jones or Antonio Brown? Start Amari Cooper or Antonio Brown? Start Antonio Brown or Phillip Lindsay? Start Antonio Brown or Derrick Henry? 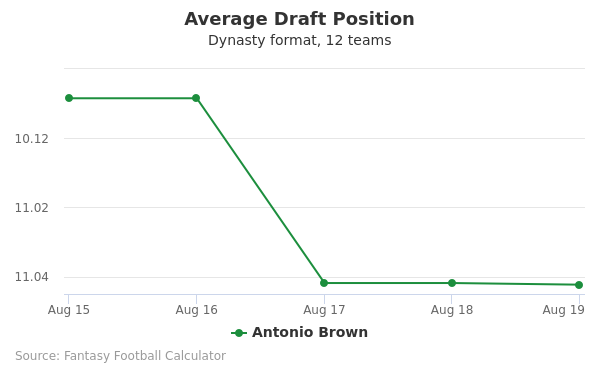 Start Antonio Brown or Stefon Diggs? Start Aaron Rodgers or Antonio Brown? Start Antonio Brown or Devonta Freeman? Start Antonio Brown or Chris Carson? Start Antonio Brown or Brandin Cooks? Start Antonio Brown or Derrius Guice? Start Antonio Brown or Kenny Golladay? Antonio Brown was born on July 10, 1988, and he went to Miami Norland High School in Miami, Florida. He was a versatile player on the school football team since he was able to play several positions including quarterback, running back, wide receiver, and punt receiver. As a Viking, he ran four hundred fifty one yards, scored thirteen touchdowns, and passed one thousand two hundred forty seven yards in just five games. Other highlights include being named North Athlete of the year at 2005 Miami Dade Gridiron Classic and being a two time Class 6A all state selection. In 2007, Central Michigan University’s football coach, Zach Azzanni, extended the invitation to try out for the team as a walk on. Within weeks, he was offered a scholarship. Brown played fourteen games during his freshman year and was awarded the Mid-American Conference Freshman of the Year. The highlights continued into his sophomore year when he started in every game and had a season high of one hundred seventy two yards, as well as his seven touchdowns. Although Brown was invited to the NFL Combine after forgoing his senior year at Central Michigan, the scouts felt he needed the final year of college to grow in size and handle the ball better before joining the NFL. He had a vertical leap of 38.5 inches. He was most noted for speed, agility, and explosiveness. In 2010, he was acquired by the Pittsburgh Steelers in the sixth round. He signed a three year contract with a salary of $1.28 million. Brown would begin as the fifth wide receiver with the Steelers. His rookie debut was made on September 19, 2010 against the Tennessee Titans where he scored an eighty nine yard touchdown. He finished the season with sixteen receptions for one hundred sixty seven yards, as well as going to Super Bowl XLV in 2011. He began the season by not just being named the third wide receiver on the Steelers roster but also was named the punt returner and starting kick returner. Brown became the first player in the NFL to have more than one thousand yards returning and receiving in the same season. He played his first Pro Bowl and caught two passes for fifteen yards. The Steelers decided to extend Brown’s contract for another five years. He was also named one of two starting wide receivers for the Steelers. He continued through the season with high yardage, but a fine for unsportsmanlike conduct and a sprained ankle blemished parts of the mid season. He made a comeback against the Dallas Cowboys in week fifteen with a season high eight catches for seventy six yards and scored a touchdown. He would finish the season with sixty eight receptions for seven hundred eighty seven yards and five touchdowns. In December 2012, Brown broke Yancey Thigpen’s 1997 single season record of one thousand three hundred ninety eight yards receiving yards. On December 29, he tied two other players in having at least five receptions in every game of a season, as well as being the only receiver in NFL history have at least five receptions and at least fifty yards in every seasonal game. He would later go onto be named to the AP All-Pro team. Brown's 2014 season did not get off to a good start when he kicked Spencer Lanning of the Cleveland Browns in his facemask. He was later fined despite apologizing and persisting it was an accident. This season, Brown would lead the entire NFL in yardage and receptions. The most notable game during this season was with the Indianapolis Colts. Brown returned a punt for a touchdown and celebrated by jumping into the goal post. He was later fined for excessive celebration. While the Stelers made it to the Super Bowl, a concussion Brown sufered in the first post season game against the Cincinnati Bengals kept him on the sidelines. In the season opener, Brown was fined for both going against uniform policy by wearing the wrong colored cleats and twerking after he scored a touchdown. He was fined for the same thing four games later. He is now in the top one hundred all time for career receptions and in the top one hundred for career receiving yards. Follow Antonio Brown on Twitter.